North mains with the class approved full length top batten are ready for purchase. Contact Lin Robson to place your order now. Will be held at Fishing Bay Yacht Club, Va on July 25-28, 2019. NOR and Registration info is available on the EVENTS PAGE. There are several very good boats available as well as some that need some love. Check the listings in the FOR SALE section. Visit the Windmill Class Association Facebook page for the latest in Windmilling news. 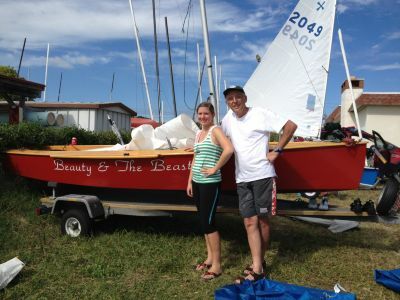 The Windmill is a 15 1/2 foot, 2-person racing dinghy designed by boat-builder Clark Mills in 1953. Having designed the Optimist Pram in 1947, Clark saw a need for a 2-person high performance dingy that can be inexpensively constructed by amateur builders. The class has since evolved with the times to allow fiberglass construction and aluminum spars, yet both wooden and fiberglass Windmills remain equally competitive. The Windmill is a born racer. Its narrow, hard-chined planing hull provides high performance. Being a non-trapeze, non-spinnaker boat makes the Windmill accessible to a wide range of sailing skills. Contact the class officers for more informaion. Length Waterline (LWL) 13' 8"
Draft - Board Down 4' 2" / Board Up 6"
The Windmill Class is a National Association of Owners and Builders of the Windmill One-Design Sailboat. Clark Mills designed the Windmill to be a challenging and exciting boat for teens to sail when they graduated from his Opti design. Today the Windmill Class brings families together from across the country to enjoy the thrill of friendly rivalry on the water and camaraderie ashore. The class newsletter - The Jouster - is published quarterly. To receive The Jouster via an email link, sign up on the "Jouster" link in the menu bar above. The Windmill Class utilizes Yahoo Groups for our communications.